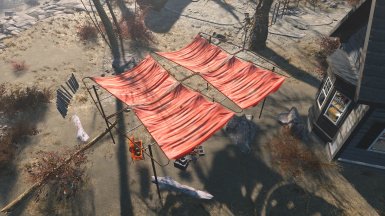 Adds a few types of animated canopies to the Wasteland Workshop. Changed ba2 compression method to fix visual artifacts issue. Added a loose files version for those with textures issues. Updated collisions for the ground canopy. Frame for the ground canopy was updated. Once more. 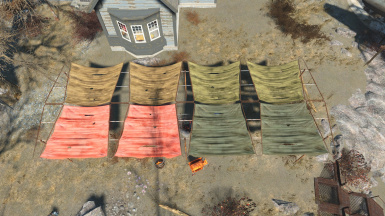 Added three "military themed" colors for all canopies. Created proper 3D preview icons for all canopies. Frame for the ground canopy was updated. New wall canopy wish a new frame. 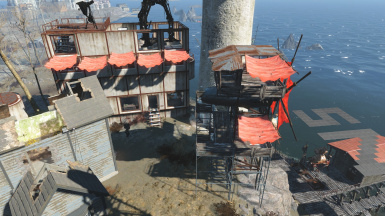 Old wall type canopy is now meant only for the roof blocks. 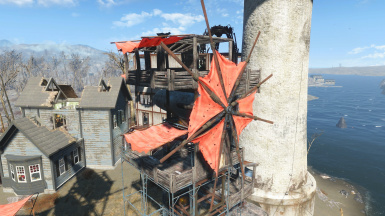 To not incite some people on arguements about what physics really is and if those canopies are qualified to be called "with physics", the name of the mod was adjusted. Also. Before you'll break that huge and terrible conspiracy of mine. Yes, yes these are vanilla canopies. 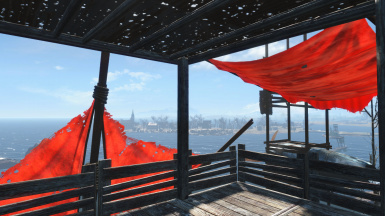 I never thought that it's something worth mentioning as you can see them everywhere around Diamond City. Now when this is out of the way, let's proceed to the actual description, shall we? 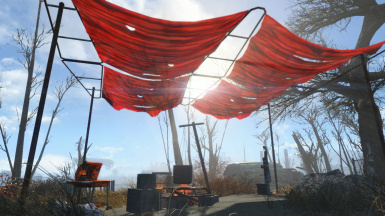 Adds three types of canopies to the Wasteland Workshop. 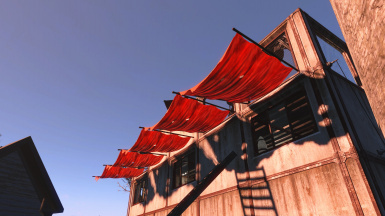 Type 1 - wall canopy. Meant to be used on the wall. It will stick to both floor and roof snap points. 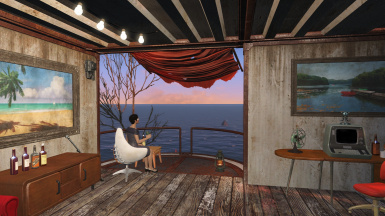 Type 2 - canopy will stick only to the roof snap points (previosly known as a wall canopy). 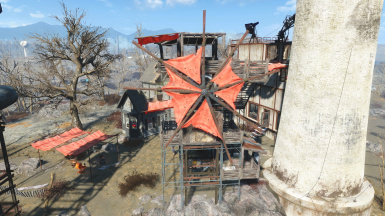 Those two are both using vanilla game snap points, so you may find them stick to many different types of walls, roofs and floors, as they all have those snap points. The last one is a ground canopy. As name suggests it meant to be placed on the ground. Those can be stacked in a few ways. All three include wind sway animation. Only a few colors are available for the time being, but you can expect more in future. 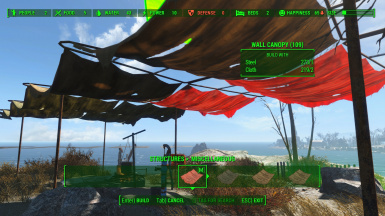 Canopies could be found under the misc category in structures. 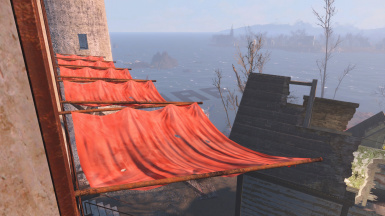 Currently wall canopie doesn't seem to snap properly or snap at all without Place Everywhere mod. This may or may not be resolved in future because of how the vanilla workshop behaves with the overlapping mesh. Thus read requirements. 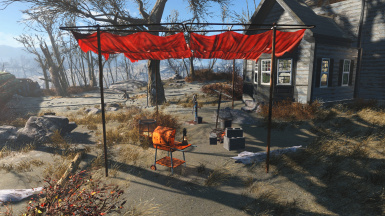 Please use Place Everywhere mod as vanilla game in some cases won't allow you to place canopies. 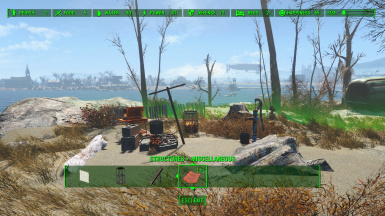 Build as you want, not as Bethesda wants you to. 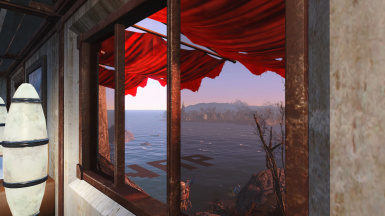 This mod is a part of a Wasteland Workshop Expansion and after some testing will be merged with the mentioned mod. Relight - revamp for the workshop lights. Glazing - allows you to glaze window frames in your concrete wall blocks. Snap Snap - adds more snaps for all solid foundation blocks and more. Cleaner Concrete - a cleaner look for all concrete block. Decent Elevators - adds a better floor for the workshop elevators.